James DeGale beat Andre Dirrell on points to claim the vacant IBF super-middleweight belt in Boston and become the first Briton to win Olympic gold and a professional world title. Londoner DeGale, Olympic champion in 2008, put Dirrell on the canvas in the second round with a devastating left. American Dirrell, 31, made a remarkable recovery and landed shots on a tiring DeGale as the match went on. But a late flurry by DeGale, 29, secured a unanimous decision. American judge Daniel Fitzgerald and British judge Howard Foster both scored the fight 114-112, while Canadian Alan Davis scored it 117-109. "It's an unbelievable feeling, I'm world champ - I made history," said DeGale, who improves to 21 wins (14 KOs) and one defeat in the paid ranks. "I will take on any super-middleweight in the world. There's no other super-middleweight that would beat me on my day." DeGale's victory could lead to a rematch with bitter domestic rival George Groves, who is set to fight Sweden's Badou Jack for the WBC title later this year. Groves, who was knocked out by Nottingham's former world champion Carl Froch in 2013 and again in 2014, beat DeGale on points in 2011. Many good judges predicted a dull fight for the belt vacated by Froch earlier this year, what with both men being southpaws and back-foot boxers. And the pre-fight omens were not good, with the fight taking place at 4:30pm local time for the benefit of American television and in front of a sparse crowd at the Agganis Arena. 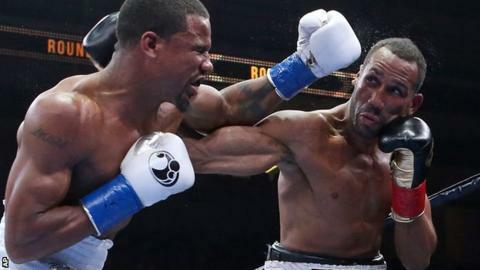 However, DeGale forced the pace in the first round and floored Dirrell with a cuffing overhand left towards the end of the second before the American touched down again. With a 10-7 round in the bag, DeGale looked to press home his advantage in the third. But Dirrell, whose heart was questioned by Froch during the build-up, stayed largely out of range and managed to clear his head. Thereafter Dirrell appeared to take control of the fight as DeGale seemed content to protect his lead, staying on the outside and throwing punches sparingly. However, many of the rounds were difficult to score, meaning neither man would have felt secure heading down the stretch. But it was DeGale who finished with the greater urgency, upping his work-rate in the final two rounds and doing enough to earn his place in the history books. DeGale becomes the sixth current world champion from the United Kingdom, which could become eight when lightweight Kevin Mitchell and featherweight Lee Selby fight for world titles in London next Saturday.